If you want to know everything there is to know about the original low budget FANTASTIC FOUR film then you must see DOOMED. With interviews with pretty much everyone involved with the exception of the guy who hired Roger Corman to do it and Avi Arad DOOMED reveals it all. For those who don't know, before the big budget versions of the FANTASTIC FOUR hit the screens a million dollar version was made in 1993 and scheduled for release in 1994. It was hoped by the people making the film that the film would boost their careers and lead to bigger things in Hollywood and maybe more movies. However as the cast and crew were out promoting the film it was mysteriously pulled right before release and buried never to be seen again...except someone had made a video copy and that hit the collectors market and as a result the film that was never supposed to be seen has been. Lovingly made the film is probably too long, and probably should be a DVD extra but considering the likely hood that the FANTASTIC FOUR will probably never officially surface that's okay. Here at last we can really be told everything that happened and why. More importantly by listening to everyone talk with deep fondness about the project you get a sense of why the film is cult favorite- it was made with love. Hell I love most of the film myself as my review from 2010 can attest. 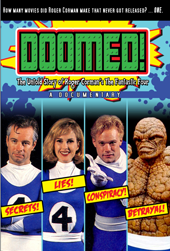 I like DOOMED a great deal and if you've ever seen the FANTASTIC FOUR or only heard about it I highly recommend this documentary. Even if you haven't this is a really good look at the weird things the Hollywood money men sometimes do. The film will be available Tuesday on digital platforms from October Films.